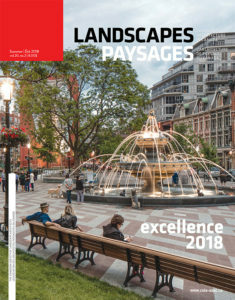 Virginia Burt Designs has been spotlighted in the summer edition of Landscape Paysages, the magazine of the Canadian Society of Landscape Architects. The brief article entitled R Garden: A Modernist Reflection That Embraces Elegance is a summary of the award winning landscape design highlighting some of the juror comments. The article can be read online, see the summer edition of Landscape Paysages, click here. Please view more images and details of the R Garden on our website: R Garden: Contemporary Sculpture Garden.